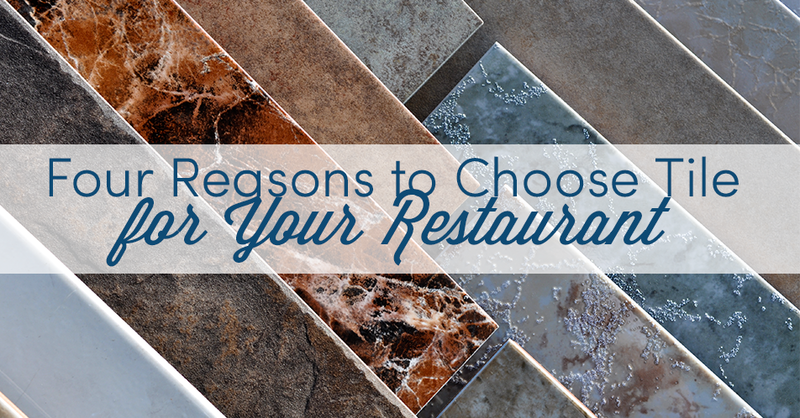 Four Reasons to Choose Tile for Your Restaurant – Mees Distributors, Inc. The flooring in a restaurant takes all kinds of abuse. From spills to wet and muddy shoes, restaurants need to choose a floor which not only looks great but can maintain its appearance year after year. A tile floor offers many benefits over other flooring options. Customers will forgive a lot of mistakes, but a dirty restaurant is not one of them. Rugs look beautiful for a short time after installation, but in a few months, they wind up covered with unsightly stains and full of odors. Wood floors are easy to damage and take a lot of time to keep looking good. But tiles are easy to clean and non-porous, so they don’t stain and never trap smells. Some restaurant owners shy away from tiles because they assume staff and guests are more likely to slip and fall on a tile floor than with other types of flooring. However, this is not true. Restaurants can apply a textured surface to their tile floors. In addition to adding a textured surface, restaurants can further reduce the chance of someone slipping by selecting smaller tiles. Tiles last a long time even in high-traffic areas. Porcelain and ceramic tiles have a particularly long lifespan. No matter how tough a floor is, it won’t last forever. When you choose a tile floor for your business, you have the option of replacing an individual chipped or crack tile instead of the entire floor. Switching out one tile is fast, easy and inexpensive. It is a good idea to purchase additional tiles when you initially install your floor in order to have matching tiles on hand for repairs. The appearance of your restaurant is almost as important as the quality of your food and service. That is why you need to choose beautiful flooring, no matter what. When you select a tile floor, you never have to worry about sacrificing style for functionality. Whether you operate a quick-serve concept or upscale dining, there is a tile floor which will not only make the lives of your staff easier but also impress your guests. A fine tile floor can become the showpiece for your business. Is it time to upgrade your restaurant’s flooring? Mees Distributors, Inc. is the best resource for tiles and stone selection in the Midwest. We offer a wide variety of commercial tiles for your choosing. You can learn more by visiting either the Cincinnati or Dayton showroom or by contacting a tile expert online for more help in choosing the best tiles for your business.